What IS Currywurst? 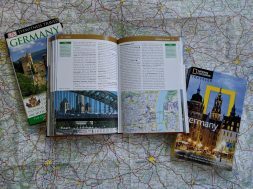 The History and How to Make it at Home! 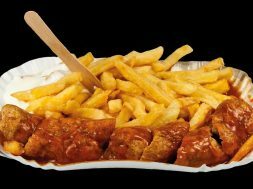 Let’s start with the basics… what IS Currywurst? When I first heard about it, I thought the sausage itself had curry in it. Nope, it’s all about the Currysauce. Generally Currywurst is ordered from a little take-away stand (although you can get it in restaurants). 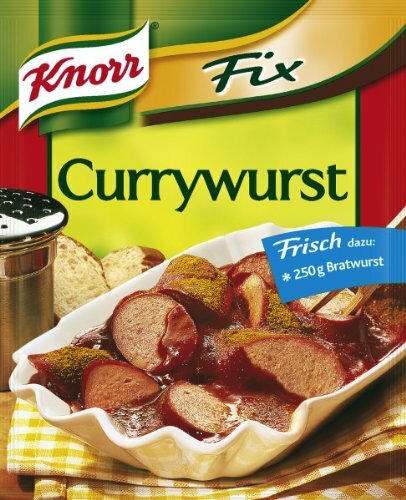 It’s made from a bratwurst that’s been grilled, and then sliced into bite sized pieces then SMOTHERED in Curry Sauce. The curry sauce is not like an Indian curry… it’s more like curry added to a ketchup or tomato sauce base. Different places use more or less of a ketchup/tomato base. (Some add Worcestershire…. others have onion pureed into the sauce). My favorite places sprinkle the top with a bit of curry powder for extra flavor. You may be able to order mild or scharf (spicey). In my opinion, the BEST way to have Currywurst is with Pommes (French Fries). I love dipping the fries into the Curry Sauce…mmmmmmm. Your portion will probably arrive on a rectangular paper tray, and you eat it all with a little fork. As the story goes, Herta Heuwer owned an Imbiss (small take away place) on the corner of Kant & Kaiser-Friedrich Straße. She was able to get some Ketchup, Worcestershire Sauce (although this ingredient is disputed…) and Curry Powder from some British Troops. She combined them, poured the sauce over a Bratwurst, and on September 4, 1949, served her first Currywurst. The combination was a huge hit! And Currywurst became the semi-official food of Berlin. Now, of course, some food historians may argue that versions of Currywurst already existed around Germany… but the legend of Herta Heuwer lives on. And, on June 29, 2013, Google honored her 100th birthday with her very own Google Doodle. You don’t need a Currywurst Recipe to make Currywurst at home. Your favorite Bratwurst, grilled, then topped with curry sauce is all it takes. I think it’s best with the Nurnberger Bratwurst… but you can experiment with this sampler pack of Bratwurst from Wisconsinmade. Now, you can spend hours over a stove creating the perfect curry sauce, and there are about 3789 recipes online for you to figure out which you like best. But I find that it’s MUCH easier to just have a bottle of German Curry Ketchup in my refrigerator. It’s also possible to mix up a quick batch from a powdered mix. 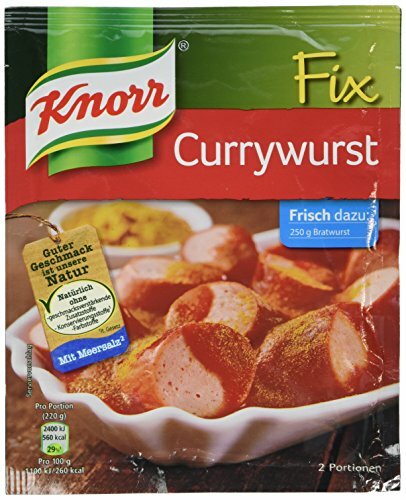 Just don’t forget that final sprinkle of curry powder for extra authenticity… and you can have the best currywurst Berlin makes, right at home. 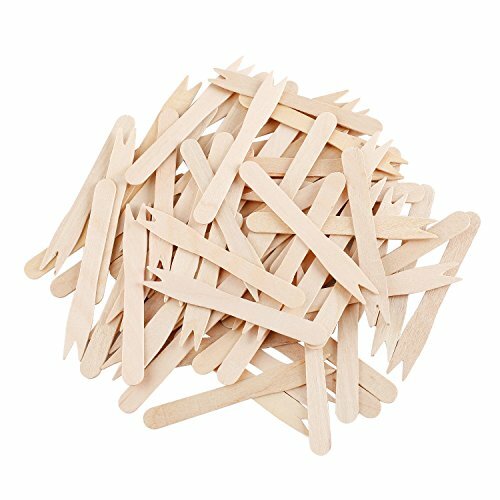 And, of course, if you love the Pommes… you NEED a little Pommes fork. 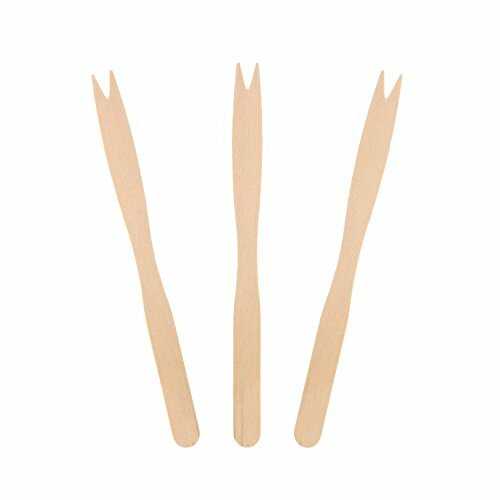 These little 2 prong forks are made from Bamboo, so they are eco-friendly! These are porcelain plates, made in Germany, and modeled after the German Currywurst Plates. Now, I’m a fan of the rectangular plates because they are fun, but they aren’t strong enough to hold up for a walk home, and they get thrown away in the garbage (because of the sauce, recycling is difficult to impossible. These plates can be used over and over again at home. This German Rhubarb Compote Recipe is Easy to Make! 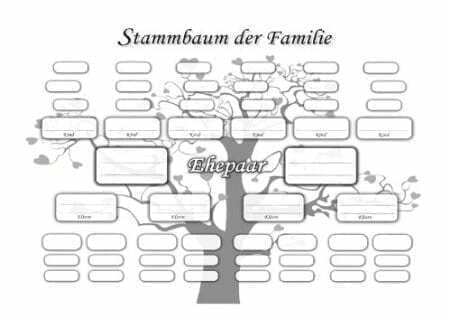 previous German Fruit Flan Recipes - Make an Obstboden!